The 2018 Passyunk Square Civic Association Home Tour will take place on Saturday, November 10th from 12:00 pm – 4:00 pm! The annual PSCA Home Tour is a self-guided ticketed event showcasing homes throughout the Passyunk Square neighborhood and is one of PSCA’s most successful and important fundraisers. This year the event is being sponsored in part by GEN3 Electric, and there will be an opportunity to learn more about their services. The tour provides a chance to see how your neighbors have made their houses homes, to compare contractors, get ideas, and meet some new friends. This year features some amazing home – include the home that is host to Percy Street’s “Electric Street” mural. We will also feature a hard-hat tour of the new Theater Exile theatre space on the ground floor of the new building at13th and Reed Streets and a behind the scenes tour of Fitness Works. Following the tour, a happy hour is being hosted Triangle Tavern from 4-6pm with a GREAT raffle of neighborhood gifts from Rival Bros Coffee, Manatawny Still Works, Bing Bing Dim Sum, Burrata and Barcelona Wine Bar. All are welcome to the Happy Hour!! Tickets are $20* in advance (*There is a small convenience fee if you purchase online) or the day of the tour at the tour start locations: 1417 S. Broad (Gen3 Hub) or B2. Please note that you will not receive an actual ticket for this event. Your name will be added to our attendee list. All proceeds benefit the programs of Passyunk Square Civic Association. Day of tickets may be purchased for $25. 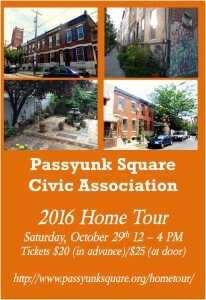 The 2017 Passyunk Square Civic Association Home Tour will take place on Saturday, October 7th from 12:00 pm – 4:00 pm! 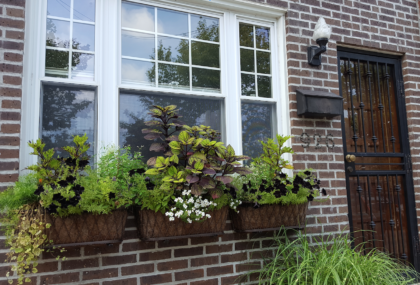 The Home Tour is a self-guided ticketed event showcasing homes throughout the Passyunk Square neighborhood and is one of PSCA’s most successful and important fundraisers. The tour provides a chance to see how your neighbors have made their houses homes, to compare contractors, get ideas and meet some new friends. This year, we will have special bonus tour – behind the scenes at Termini Bros Bakery! An after party will be hosted at Triangle Tavern from 4:00 pm – 6:00 pm with a raffle for great additional prizes from spots around the neighborhood. Tickets are $20* in advance (*There is a small convenience fee if you purchase online) and can be purchased here. Please note that you will not receive an actual ticket for this event. Your name will be added to our attendee list. All proceeds benefit the programs of Passyunk Square Civic Association. Day-of tickets may be purchased for $25 dollars at the starting location (TBD). The 2016 Passyunk Square Civic Association Home Tour will take place on Saturday, October 29th from 12:00 pm – 4:00 pm! 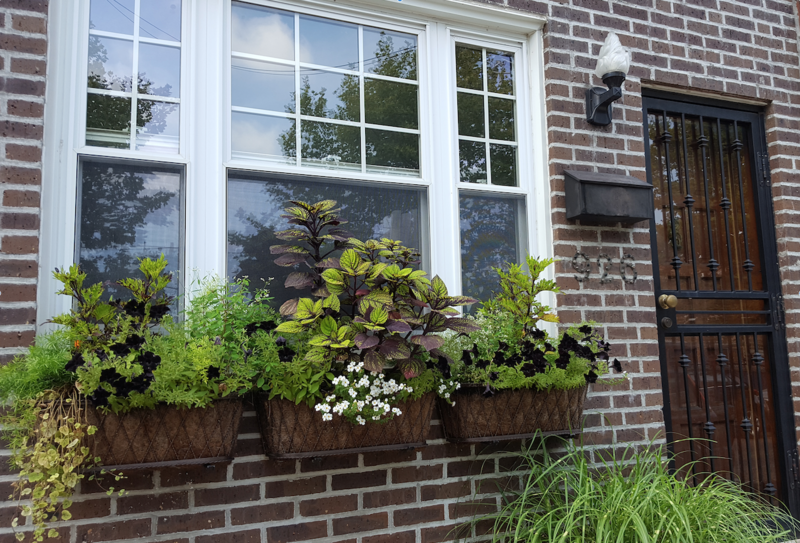 The Home Tour is a self-guided ticketed event showcasing homes throughout the Passyunk Square neighborhood and is one of PSCA’s most successful and important fundraisers. The tour features homes in all stages of renovation, providing a chance to compare contractors, get ideas, and meet neighbors. Tickets are $20* in advance (*There is a small convenience fee if you purchase online). Please note that you will not receive an actual ticket for this event. Your name will be added to our attendee list. If you prefer to purchase your ticket in advance with cash, please contact us at andrew@andrewstober.com to make arrangements. All proceeds benefit the Passyunk Square Civic Association.